AudioJack is a versatile tool to obtain your favorite music from the internet in a legal manner. To achieve this goal, AudioJack does not search some obscure file-sharing networks for your favorite songs but takes advantage of the abundant selection of internet radio stations which deliver an incredible variety of music 24/7. 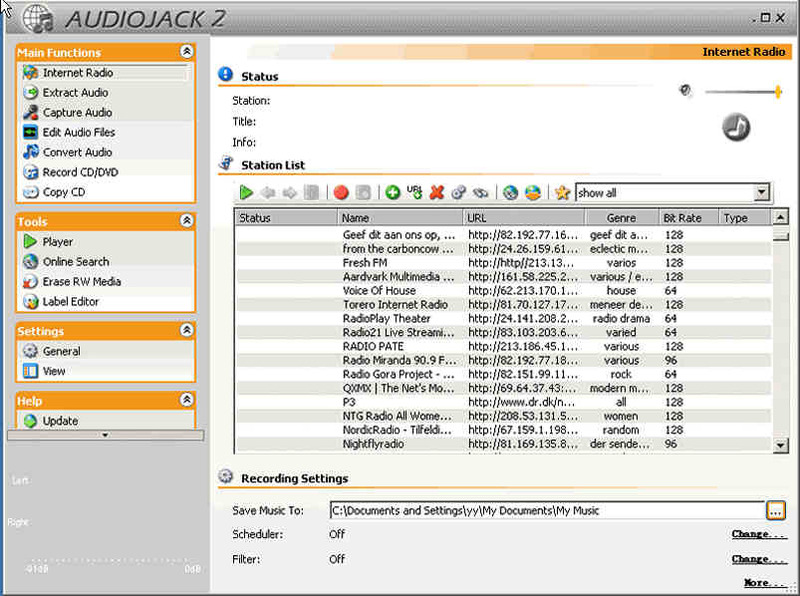 AudioJack comes with a large list of internet radio stations and a search function to find your favorite one. A filter takes care of songs from your favorite artist and a scheduler offers the opportunity to record a certain program, just like your VCR. AudioJack detects artist and song title automatically from the received radio stream and offers the unique feature of recording a title belatedly, for example if you find a song interesting after listening to it for a minute or so. In this case, simply lick the instant recording button and AudioJack will save the current song completely. In addition to this, AudioJack comes with the right set of matching tools to make radio a new experience: Edit the recorded sound bits with the built-in audio editor and record them to CD or DVD with the integrated recording engine. Finally, put a label on your disc, created with the built-in label editor.